Ceduna is a town in South Australia located on the shores of Murat Bay on the west coast of Eyre Peninsula. Start off your visit on the 13th (Sat): take some stellar pictures from Head of Bight. 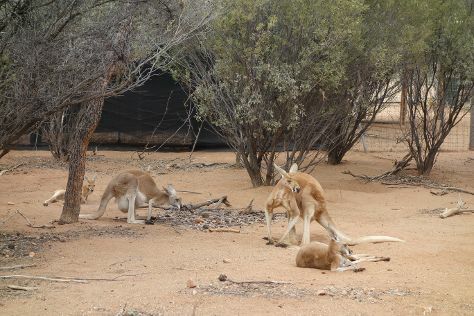 On your second day here, trek along Goog's Track and then make a trip to Ceduna Jetty. To see photos, ratings, more things to do, and tourist information, read Ceduna trip planner . Dubai, United Arab Emirates to Ceduna is an approximately 23.5-hour flight. The time zone changes from Gulf Standard Time to Australian Central Standard Time (South Australia), which is usually a 5 hour difference. Plan for cooler temperatures traveling from Dubai in July, with highs in Ceduna at 20°C and lows at 6°C. Finish your sightseeing early on the 14th (Sun) so you can travel to Nullarbor. Kick off your visit on the 15th (Mon): don't miss a visit to Great Australian Bight. Get ready for a full day of sightseeing on the 16th (Tue): explore the striking landscape of Nullarbor National Park. To find where to stay, more things to do, photos, and other tourist information, you can read our Nullarbor trip itinerary website . Traveling by car from Ceduna to Nullarbor takes 6.5 hours. Finish up your sightseeing early on the 16th (Tue) so you can travel to Kings Canyon. On the 17th (Wed), make a trip to Kings Creek Station, then see the world from above with a helicopter tour, and then explore the stunning scenery at Kings Canyon Walk. Get ready for a full day of sightseeing on the 18th (Thu): identify plant and animal life at Watarrka National Park. To find other places to visit, maps, more things to do, and other tourist information, use the Kings Canyon route planner. You can drive from Nullarbor to Kings Canyon in 24.5 hours. Finish your sightseeing early on the 18th (Thu) to allow enough time to travel to Alice Springs. Alice Springs is known for wildlife, museums, historic sites, nature, and parks. Your plan includes some of its best attractions: look for all kinds of wild species at Alice Springs Desert Park, take some stellar pictures from Anzac Hill, take an in-depth tour of Alice Springs School of the Air Visitor Centre, and steep yourself in history at Alice Springs Telegraph Station Historical Reserve. For more things to do, ratings, traveler tips, and other tourist information, go to the Alice Springs vacation planner . Traveling by car from Kings Canyon to Alice Springs takes 6 hours. In July in Alice Springs, expect temperatures between 24°C during the day and 3°C at night. Wrap up your sightseeing on the 21st (Sun) to allow time to travel back home.